VICTORIA FALLS, Zimbabwe (PAMACC News) - Africa is at the crossroads of safeguarding development progress under an expanded Millennium Develop Goals (MDGs) whilst remaining faithful to the global call for action against climate change, says Mithika Mwenda, Secretary-General of the Pan African Climate Justice Alliance (PACJA). According to him, the continent is the battle ground for competing global interest and as climate change acquires political-economic dimensions, African countries are squarely at the crossroads to decide which global grouping to side with. “The continent is at the crossroad of choosing the fossil fuel-based development pathways or adopting low carbon development trajectory with its consequences of cost,” he said. 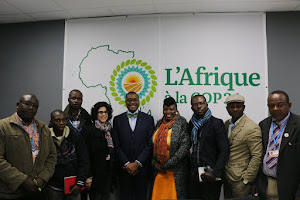 He therefore expects Africa to work harder to keep prospective speculators who would wish to take advantage of vulnerable African countries to serve their interest at the climate change talks in Paris in December 2015. Mithika was addressing a Pre-CCDA workshop which is looking at what is a stake for Africa in Paris in “shaping an ambitious, sustainable, equitable and legally binding climate agreement”. The Fifth Climate Change and Development Conference for Africa (CCDA-V) is holding Victoria Falls, Zimbabwe from October 28–30 on the theme: "Africa, climate change and sustainable development: what is at stake at Paris and beyond?" Ahead of the event, the World Resources Institute (WRI) and PACJA are holding the workshop with the aim to contribute to Africa’s preparedness for COP21 and beyond. 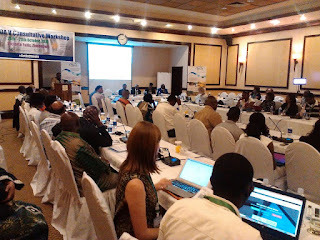 Participants include African negotiators and other stakeholders within the continent, in particular civil society, legislators, private sector, and implementing agencies to strengthen capacity on key issues pertaining to the 2015 Climate Agreement. “We need to think globally but act locally” when it comes to the issue of climate change, stated Yamide Dagnet of the WRI, a Think Tank. The Pre-CCDA is assessing the options on the table on ambition cycles, adaptation, land use and forest, support, and by exploring capacity building needs related to implementation and the legal implications. Zhakata Washington with the Zimbabwean Delegation to the UNFCCC has acknowledged African civil society speaks louder and more effective than governments in persisting to seek solutions. To ensure implementation of decisions taken, he has tasked CSOs “to continue giving us [governments] the pressure”. The Pan African Parliamentarian Network on Climate Change (PAPNCC) says it would be keeping an eye on the African Group of Negotiators, government representatives and other stakeholders to ensure the African position is upheld in the interest of people on the continent. “We stand for one Africa, one voice and one position; it’s the only key of success and I believe very strongly that when we stand on this we’ll succeed in Paris,” said Cameroonian parliamentarian and Executive Secretary of PAPNCC, Awudu Cyprian Mbaya. Africa contributes least to climate change but the people on the continent are most vulnerable to the impacts of the changing climate.